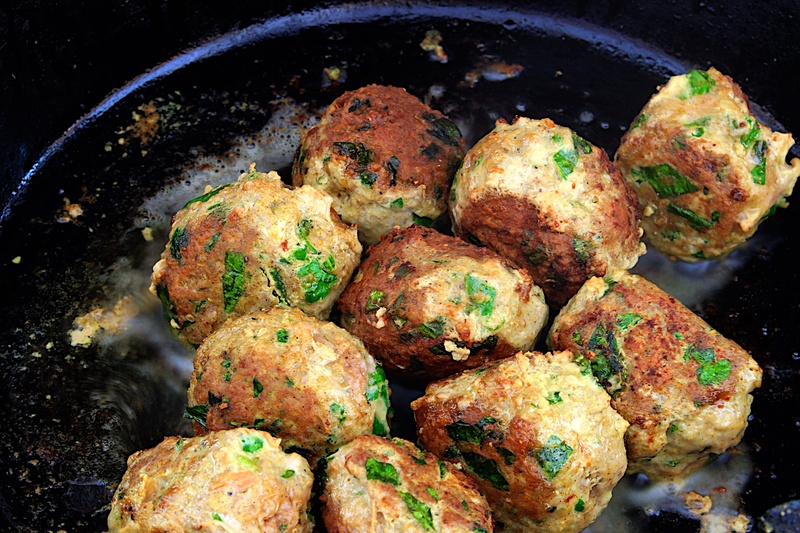 These meatballs have a delicate and herby character. Instead of a garlicky beef meatball in tomato sauce, I think you'll enjoy these pork meatballs perfumed with fresh lemon thyme. The milk soaked bread, as well as the butter, helps keep them from drying out. 1- Cut the crusts off your bread, and cut or tear it into pieces, about 1 inch. You should have about 1/2 cup of bread pieces. Put these in a large bowl and mix in the 2 TBS of milk. Set it aside to let the bread soak up the milk. 2- Meanwhile, finely chop your shallot and put it in a saute pan with the 2 TBS butter. Cook this mixture on medium low heat for about 3 minutes, until the shallots are soft, then turn it off. 3- Finely chop the mushrooms, chives, parsley, and lemon thyme and add them to the bowl with the bread. Add the egg and mix well. Add the salt, pepper, pork, shallots (with all the butter) and mix well again. 4- Get a little dish of cold water to dip your hands into. Wet hands will help you shape nice, smooth meatballs. Shape the mixture into meatballs about 2 inches in diameter. Heat a cast iron or heavy skillet very hot and add the meatballs in a single layer. Saute 30 seconds, roll them around, saute another 30 seconds, and repeat until they are pretty uniformly brown. 5- Add 1/2 cup water or beef stock and turn the heat to low. Cover the pan and finish cooking the meatballs for about 4-5 minutes, until cooked through. These should not be saucy, because they are meant to be served with a saucy dish like Liza's Beans and Greens. For a variation, try making these half sized (about 1 inch diameter) and adding them to a soup such as minestrone or Italian wedding soup. If you want, you can freeze these before cooking them, and later cook them straight from the freezer, doubling both the searing time and the simmering time.